Unfortunately, we no longer carry the SimuGator Analog LSAT watch, and won’t for the foreseeable future unless something changes. It was and still is a great watch—might even be a collector’s item one day. So snag one if you happen to come across it as its value will surely increase. Despite healthy demand, we have decided to suspend production of the watch at the present moment to focus on our new digital offerings. It retailed for $34.99 on www.simugator.com. However, we can recommend several watches that you can use for timing yourself on your LSAT PrepTests and exam-day test. The following are a few simple yet quality analog watches with unidirectional rotating bezels (key for easy resets at the start of each LSAT section with a simple twist of the bezel). Each won’t break the bank either. Currently $38.99 Shipped and Sold by Amazon. This is the best quality watch of the three we recommend here. Currently $16.99 Shipped and Sold by Amazon. This watch is very popular and has good reviews—ranked #2 in Watches on Amazon.com at the time this article was written. Currently $16.99 Shipped and Sold by Amazon. Watch has a slightly different look as the one above and slightly different specs, but still has an exceptional rating. We suggest the analog watches mentioned above over other LSAT watches (also known as LSAT Timers) with numbers up to only 35 minutes and that can’t be used for anything else other than the LSAT. These types of watches or timers lack bezels. You don’t want to be adjusting a watch’s dial during the LSAT. It’s imprecise and much more difficult to do quickly in a stressful environment like the LSAT exam room. A bezel is quick and easy, and it is the preferable way to adjust your starting time at the beginning of each section. We also believe many of those watches lack the quality of larger manufacturer’s watches like the ones we mention above. This is only what we’ve observed ourselves and from reviews online. Always look at the average ratings of any watch you buy online before you buy it. Amazon is a good resource for checking ratings before you buy. Those are our recommendations for analog LSAT watches. 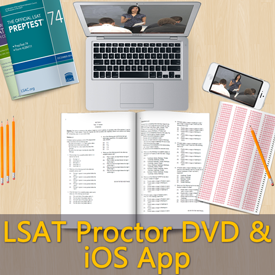 Also note, if you have not already gotten the SimuGator LSAT Proctor (Available on Amazon, the App Store, and via Instant Streaming on any device), you may want to consider getting it as well to help you simulate realistic conditions on your LSAT PrepTests. We hope this information helps you find a suitable analog LSAT watch. We strive to help students be comfortable with their exam-room environment and timing on test day. We wish you the best of luck in your practice and on the real thing. Feel free to share this article with anyone who might find it useful and share your comments with us below.